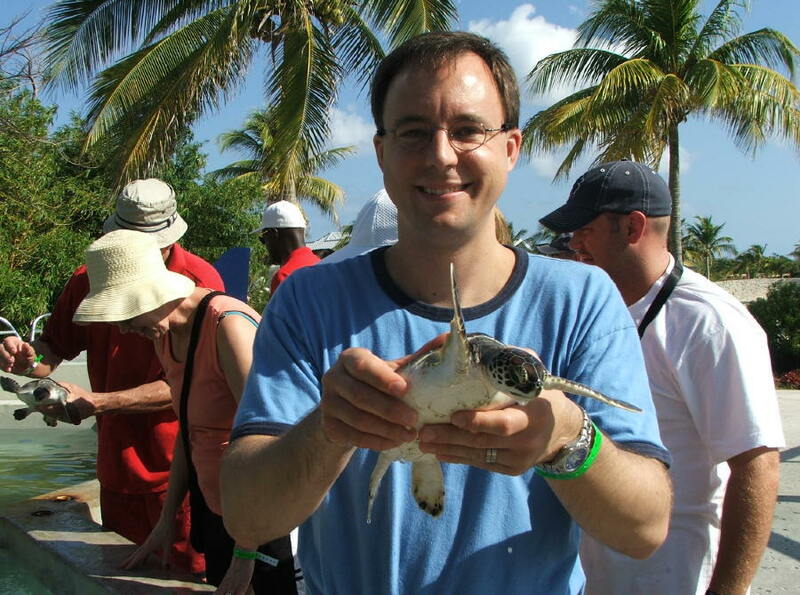 Today I added more pictures from the day we were at Grand Cayman. We had fun in the jungles of Jamaica and Stingray City off Grand Cayman. Here are the first few days of pictures. 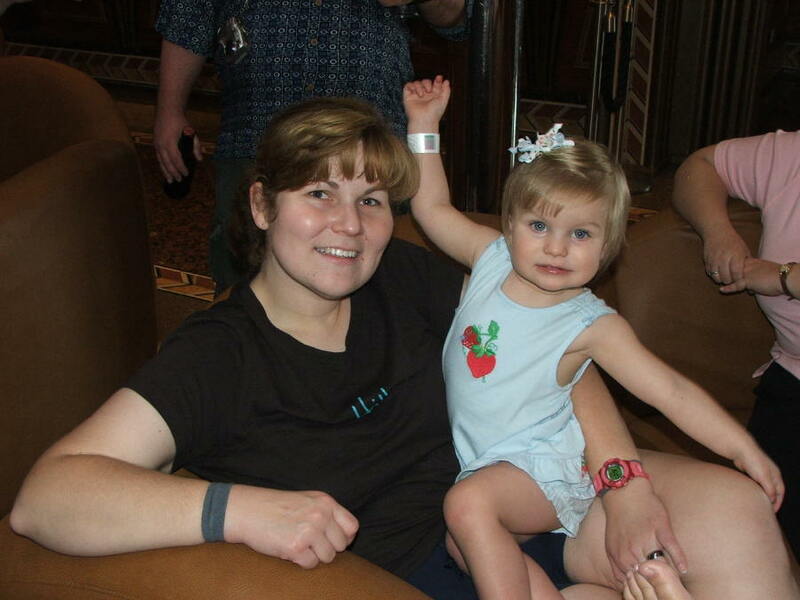 We were at the hotel in Galveston, then at sea. 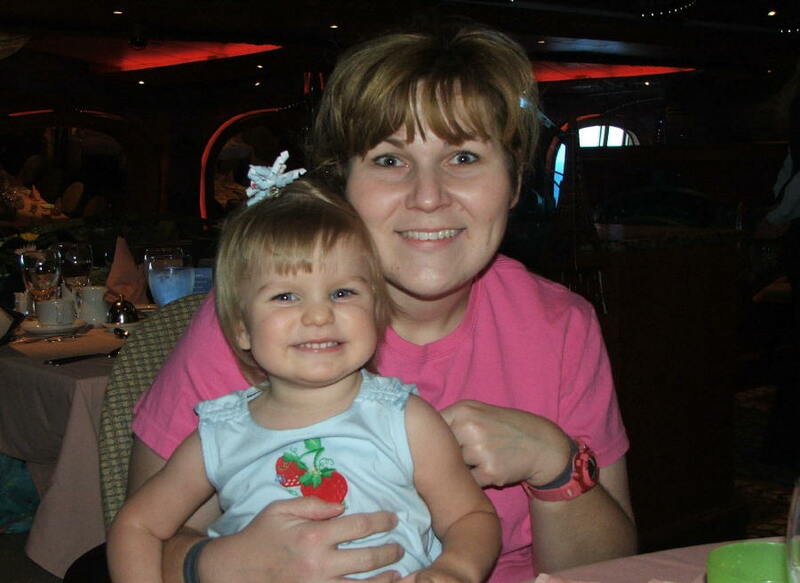 On Saturday, March 1st, 2008, we drove down to Galveston Island. 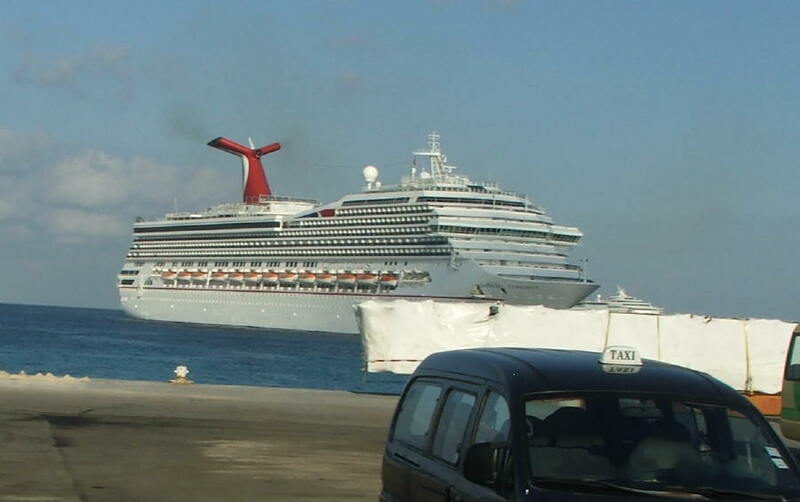 The next day, we, along with twelve friends and family members, set sail for the Carribbean on board the Carnival Conquest. 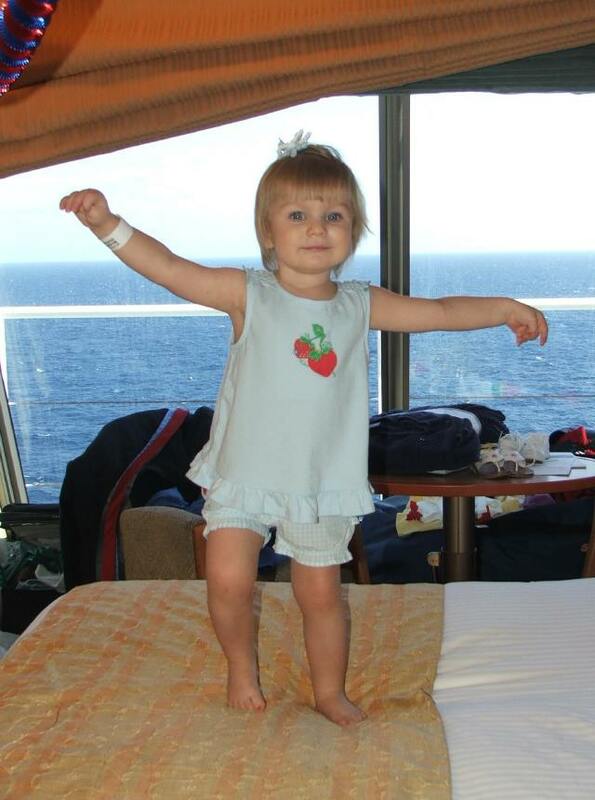 The cruise lasted seven days, and between the four cameras we brought along and the cameras of our traveling companions, we have a wealth of pictures to share of our adventures! I'm putting this page together as I go along. 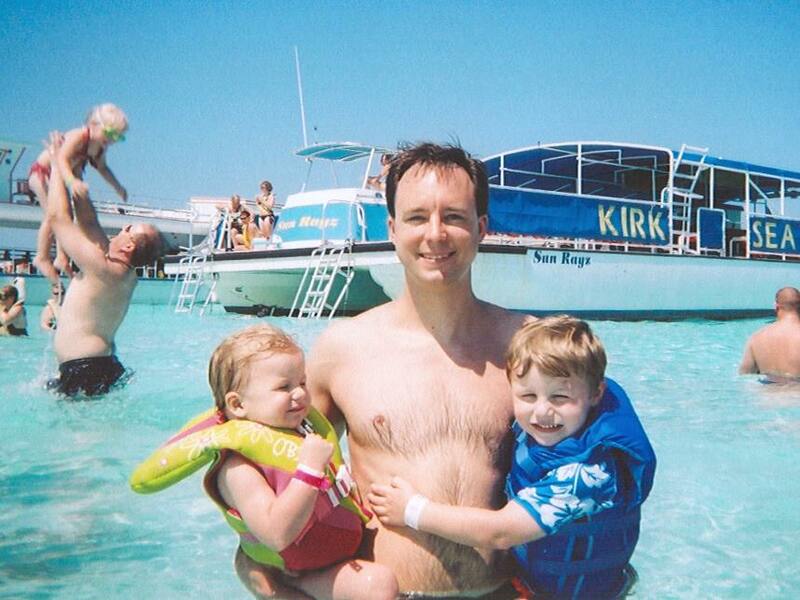 Just yesterday we got the pictures back from the disposable underwater camera, and I plan to scan in the professional photos we had taken on board the ship. 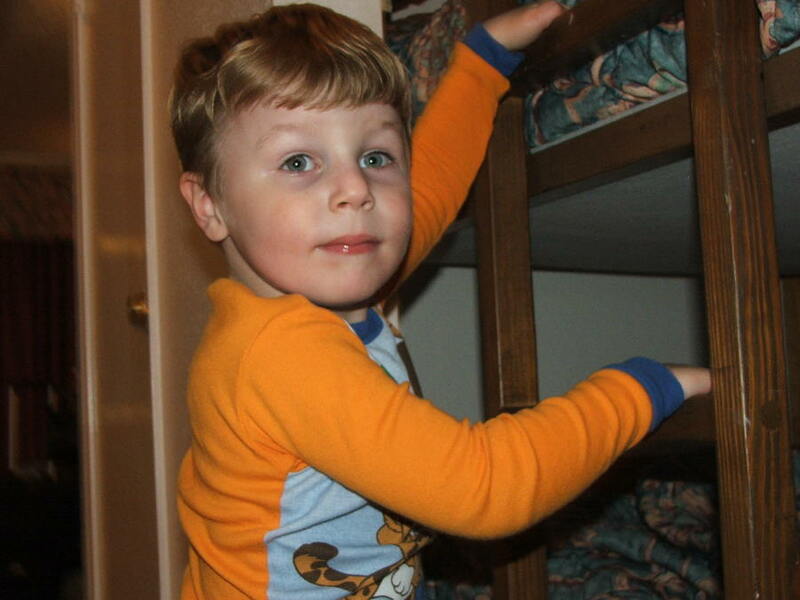 Just like back home, the hotel we stayed in had wooden bunkbeds for the children. 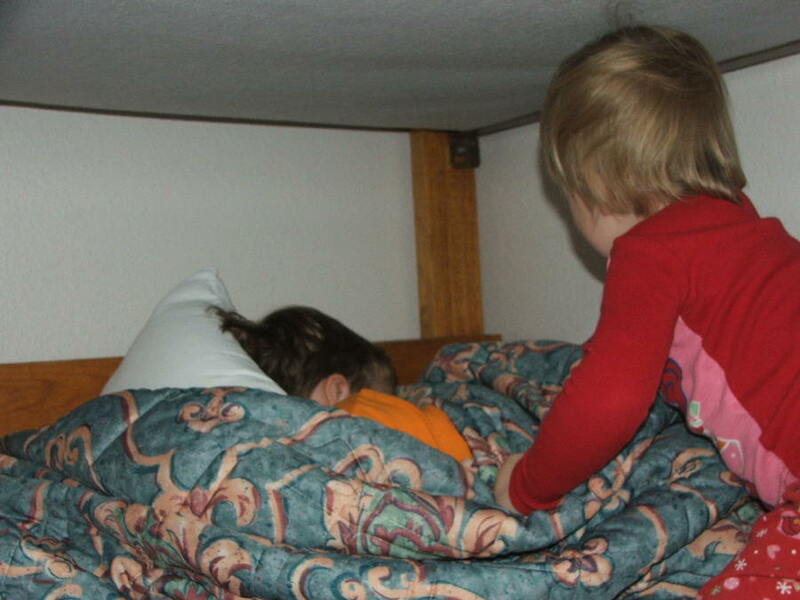 Alex slept on the top bunk. Teagan is only two, and has no concept of how scandalously filthy hotel comforters can be. 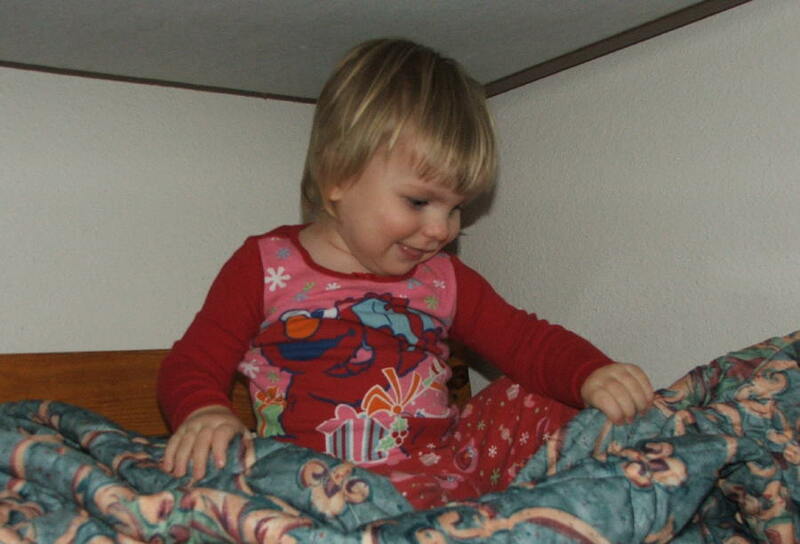 She gets the bottom bunk, and she is happy. Get up brother, get up! It's time to go on the Big Boat! 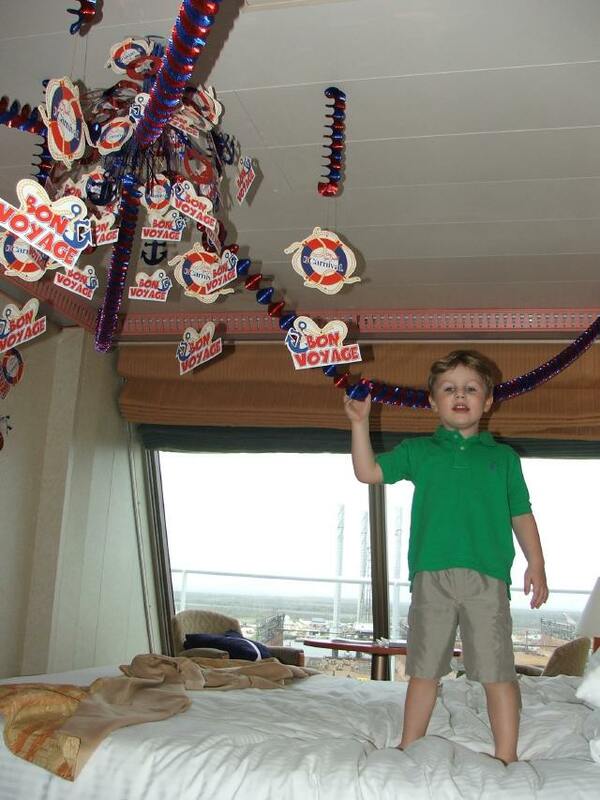 Mommie surprised us all by arranging to have these nifty decorations set up in our stateroom ahead of time. Since the ceilings (and, indeed, many other parts of the room) were metal, much of it was suspended from magnets. 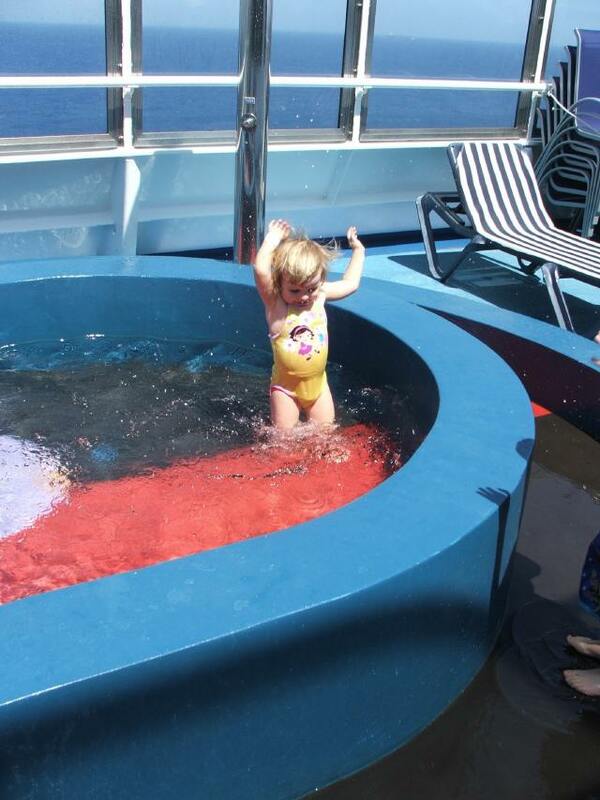 While exploring the ship, we stopped for an ice cream break at the Sky Pool, located at the stern. 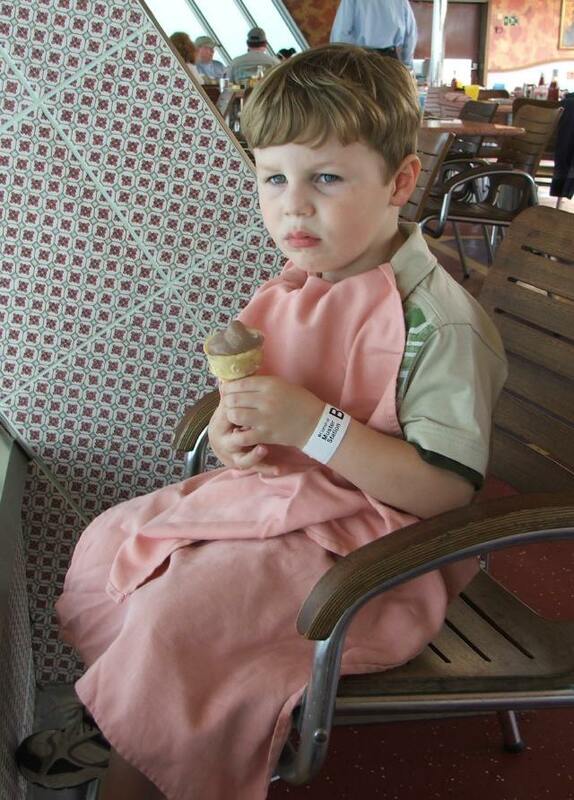 I transformed Alex into Napkin Man and he was able to enjoy his soft-serve while watching the Big Boat churn up its wake. 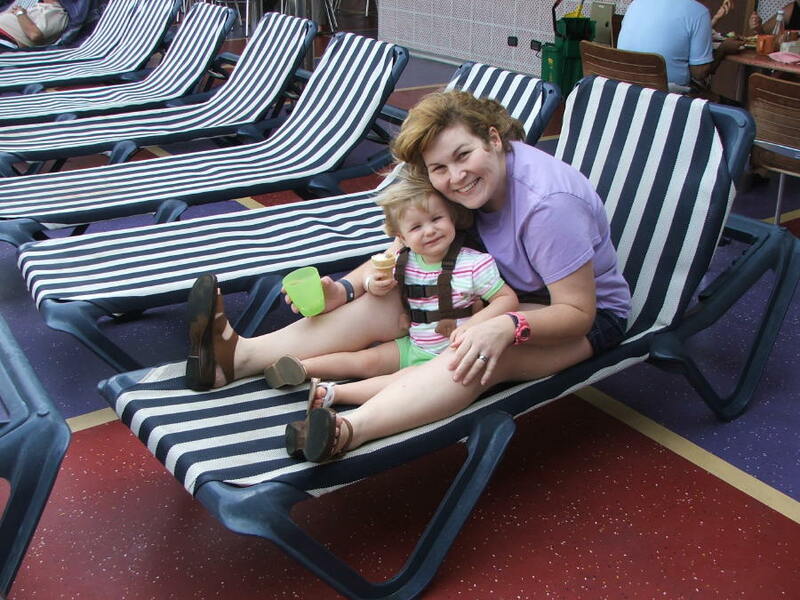 As Alex ate his ice cream, Mommie and Teagan relaxed on one of the many deck chairs. Ironically, the Sky Pool is recessed down into the ship's hull and has a retractable roof that can cover the deck, blocking your view of the sky. The screws are too far under the water to see, but they are powerful enough to leave a long wake behind the ship. 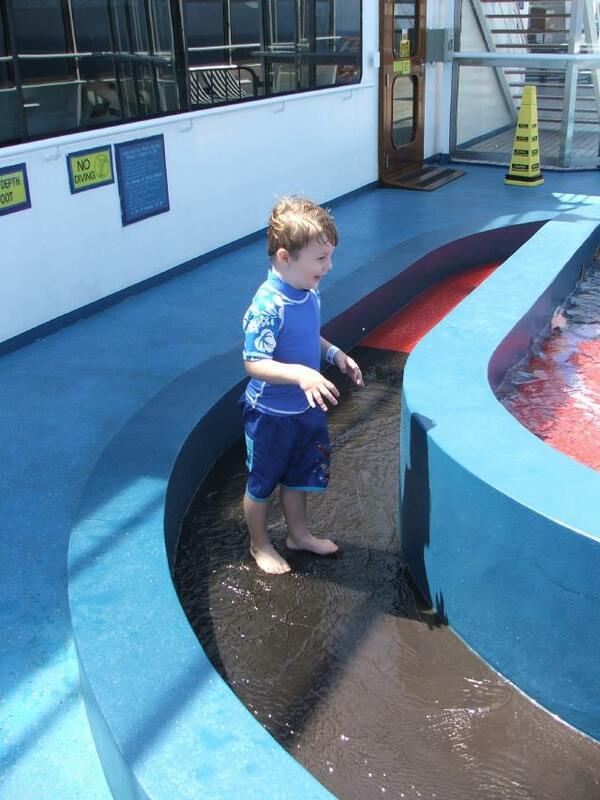 Alex thought the Big Boat must've been cleaning the ocean, since you could only make so many bubbles by using soap. Teagan's cuteness allows her to make instant friends wherever she goes. 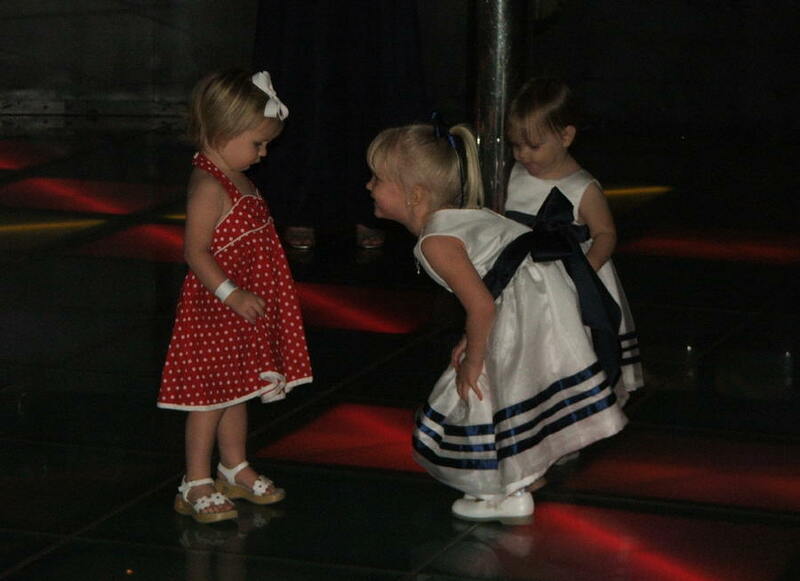 We stopped briefly at Henri's Disco so she could dance with some other girls. 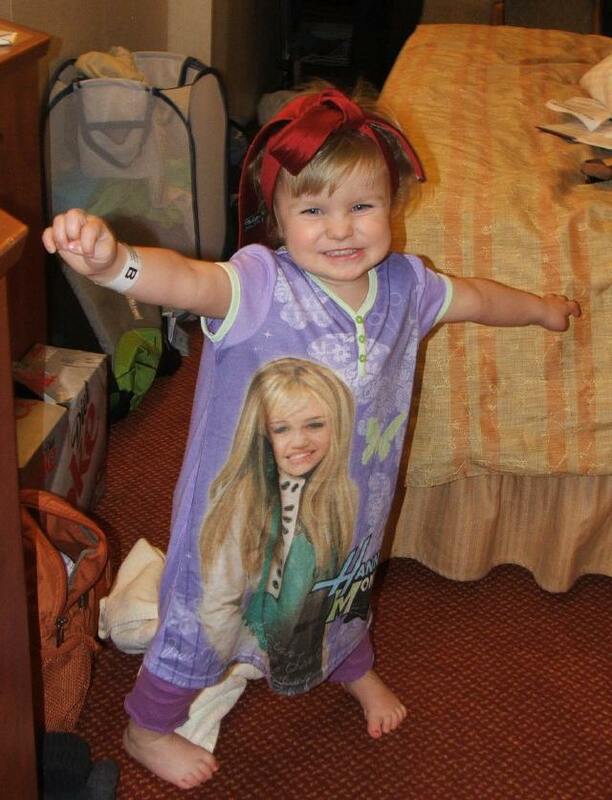 Teagan woke up the following day in her Hannah-Tannah jammies. She loves Hannah-Tannah. Teagan gets her Sunny Clothes on, and gets a well-deserved snuggle from Mommie. Teagan likes to jump on our bed at home. The large bed in our stateroom was a suitable substitute while we were away. 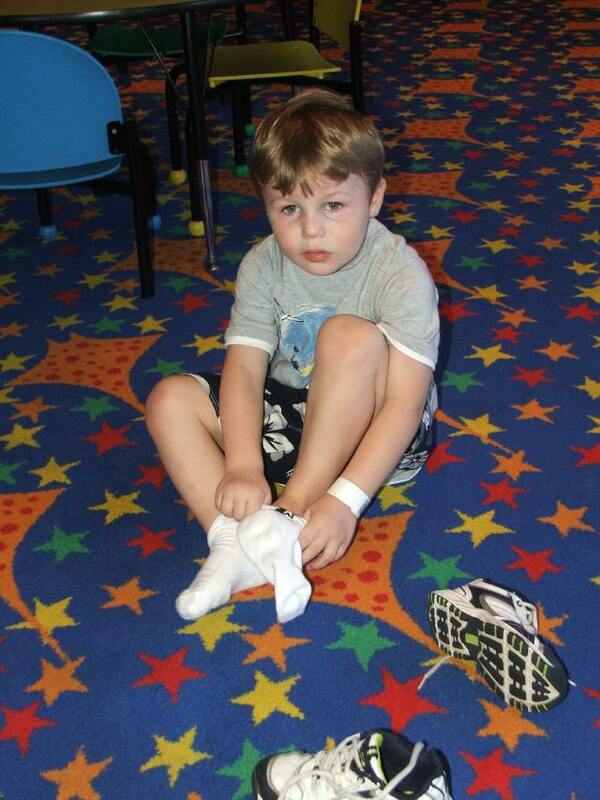 Alex spent a lot of time at Camp Carnival, the on-board children's center, though not without incident. 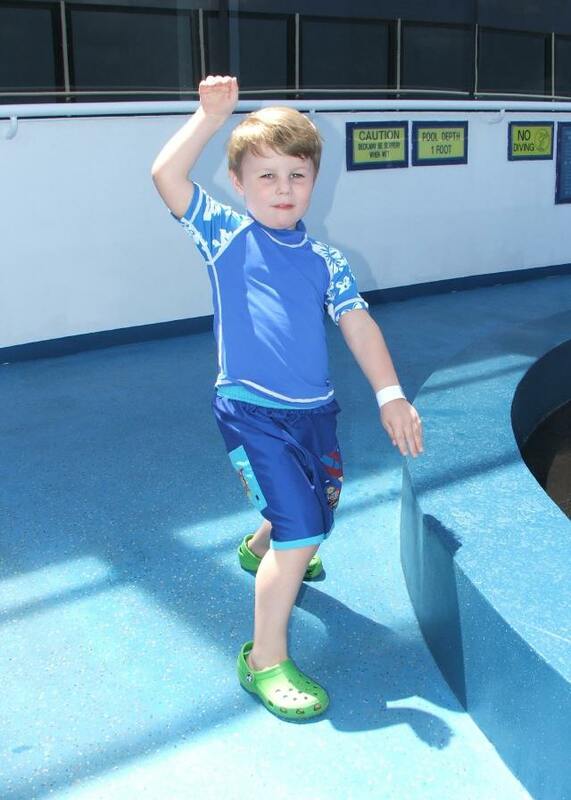 Despite the ocean, turtles, and stingrays, Alex claimed Camp Carnival was his favourite part. 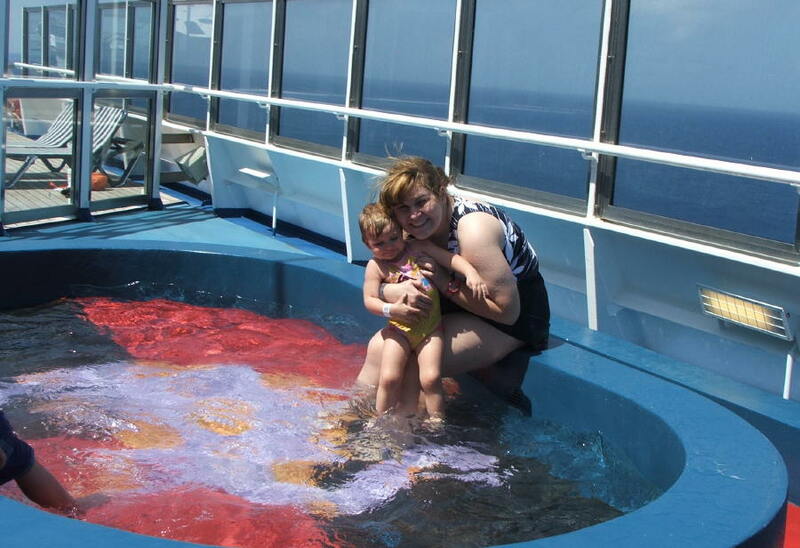 On the fore of the ship on the 12th deck, there is a shallow pool filled with cold, filtered ocean water for children to swim in. It's nice and shallow, although this part of the ship is very windy when you're moving. Alex asked many times to swim, and we wanted him to be ready for Stingray City, so we came here. Alex found out that the water in the kids' pool was much colder than and didn't taste as good as the water in the bathtub back home. 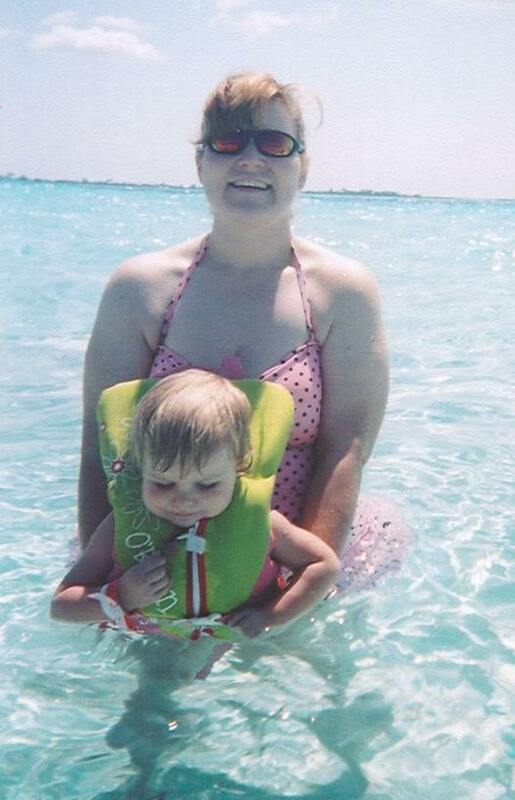 Teagan got to swim too, in her Little Einsteins swimsuit. The water is very shallow, and the floor is roughened intentionally to make it easier for little feet to maintain their grip. Even Mommie got into the act, helping Teagan enjoy her time at the Kids' Pool. 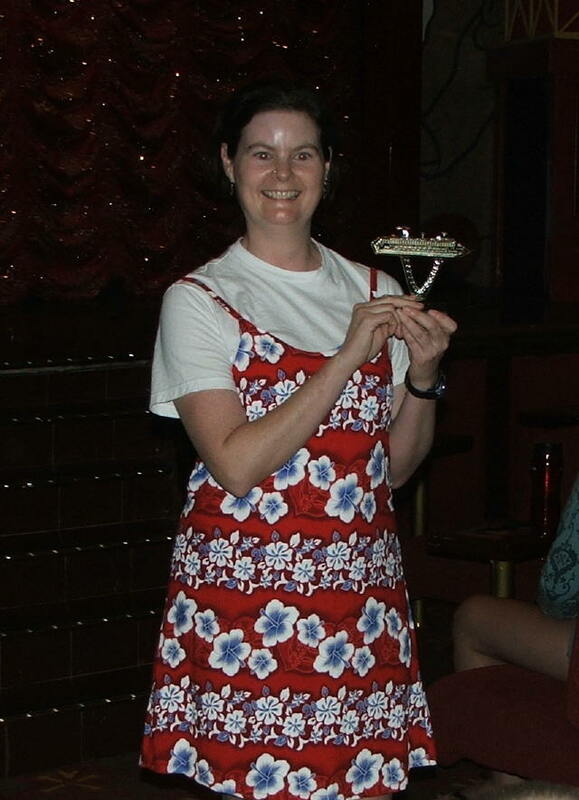 Later, our friend Linda won a gold Ship-on-a-Stick. Carnival offers these to passengers who compete in one of its many shipboard contests; this one was a trivia quiz. All in all, Linda became something of a Champions' Champion, taking home three golden ships! Here are Teagan and Mommie at the Toulouse-Lautrec lounge. 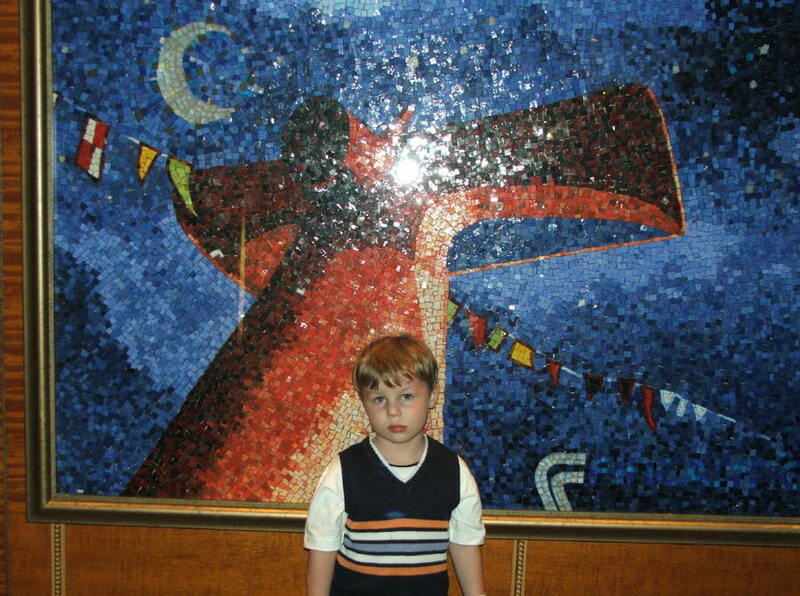 Everything important on the ship is named for and decorated in the style of Impressionist artists. The Toulouse-Lautrec is actually three stories tall, allowing a substantial portion of the passenger compliment to be seated at once. 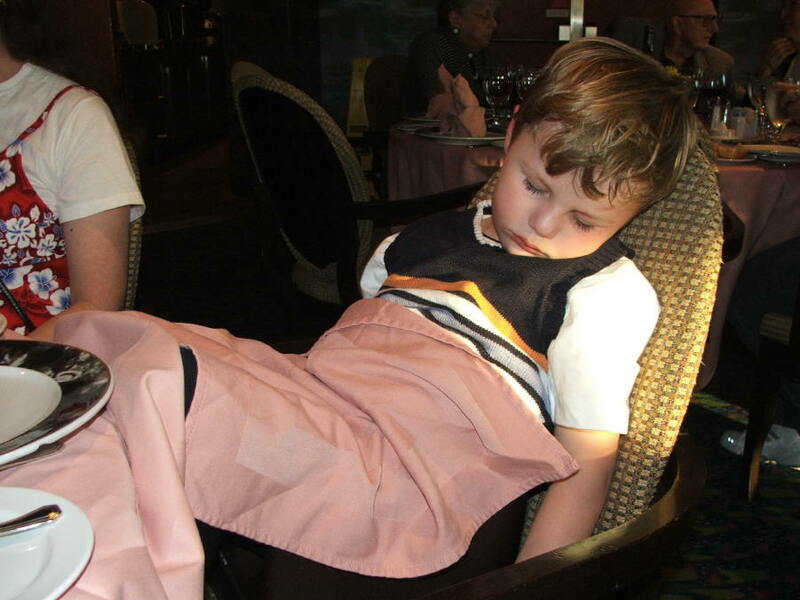 While we waited for dinner, Alex passed out in my arms, and remained asleep even after I put him in his chair at the dinner table. 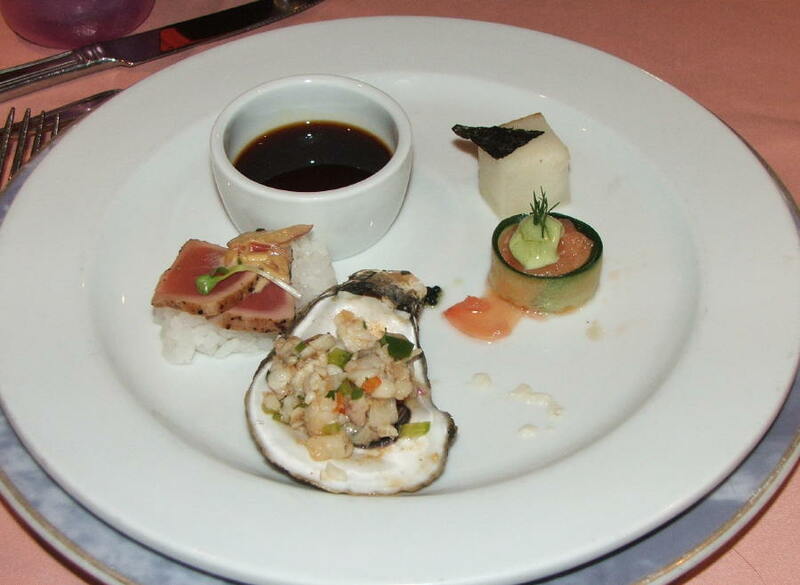 We had plenty of delicious sushi while on board. One night, sushi was even offered as an appetizer. 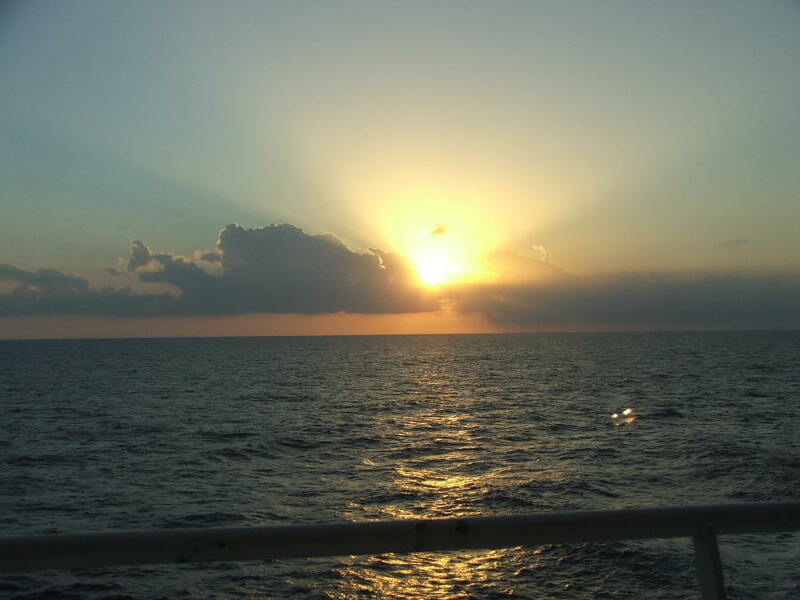 Here is the sunset as seen from the Monet Restaurant at the ship's stern. Alex recognized the ship's funnel from pictures Kellie and I took on our honeymoon. This mosaic hangs just inside the double sliding doors near the Sun Pool. 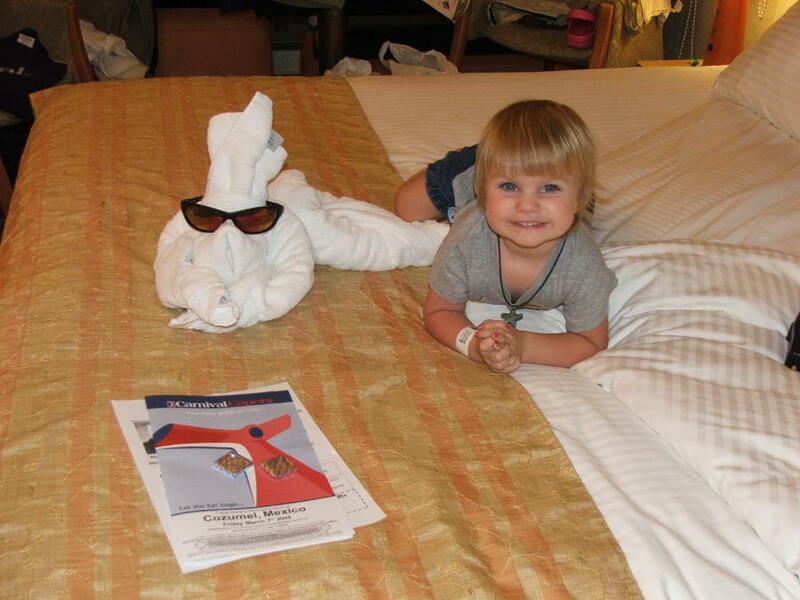 Each night, while the guests are away at dinner, the cabin stewards come in, reassemble the room, and leave a "Towel Pal", a small animal made from the ship's bath towels. 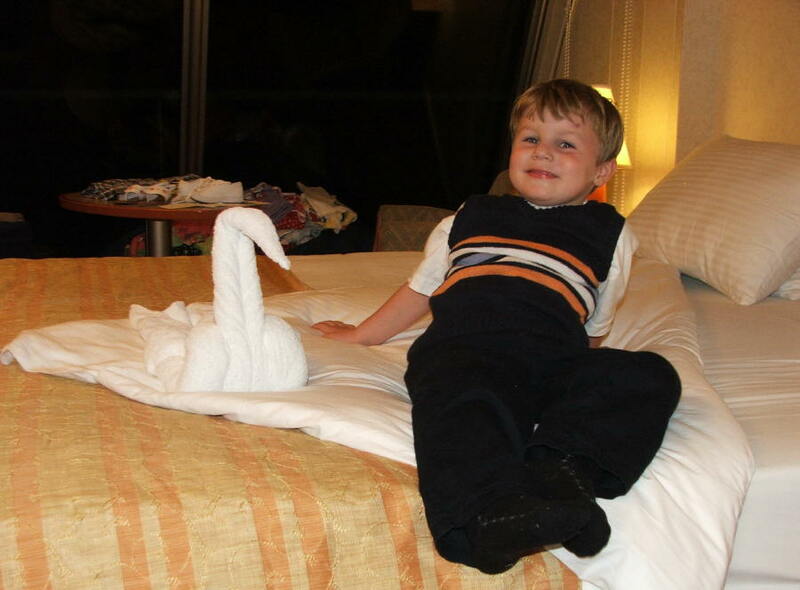 The first Towel Pal to survive contact with the children long enough to be photographed was this swan. Mommie also bought us a book that shows how to make the Towel Pals, so we can have them at home now, any time we want! 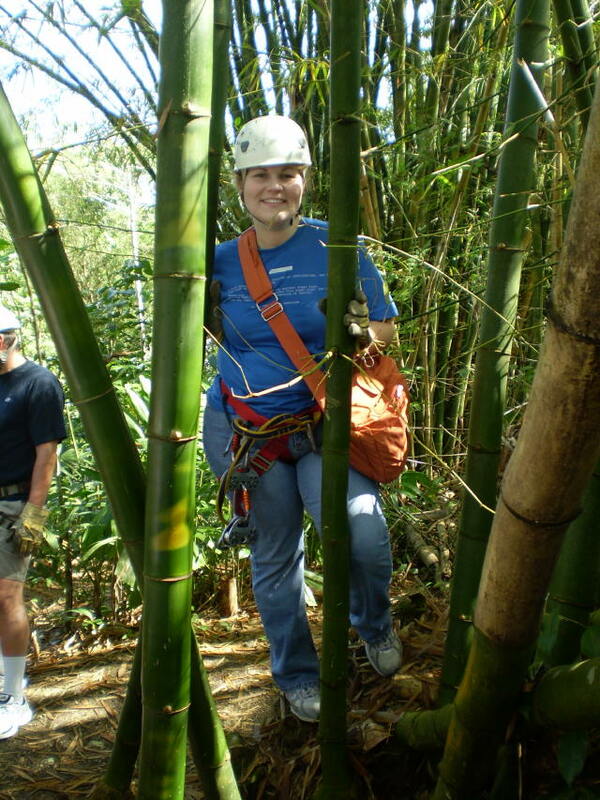 We journeyed deep into the jungles of Jamaica and suited up for adventure in the trees! 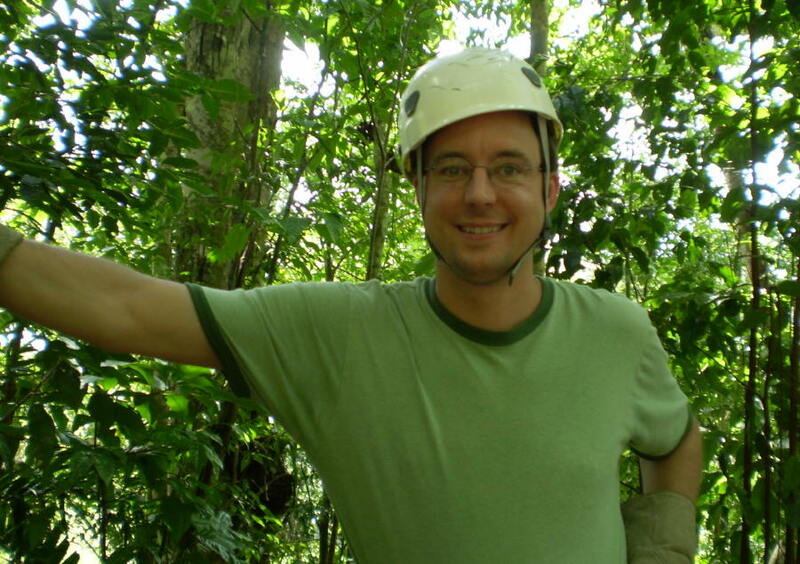 We were all issued harnesses, heavy gloves, and stylish helmets for our jungle adventure. 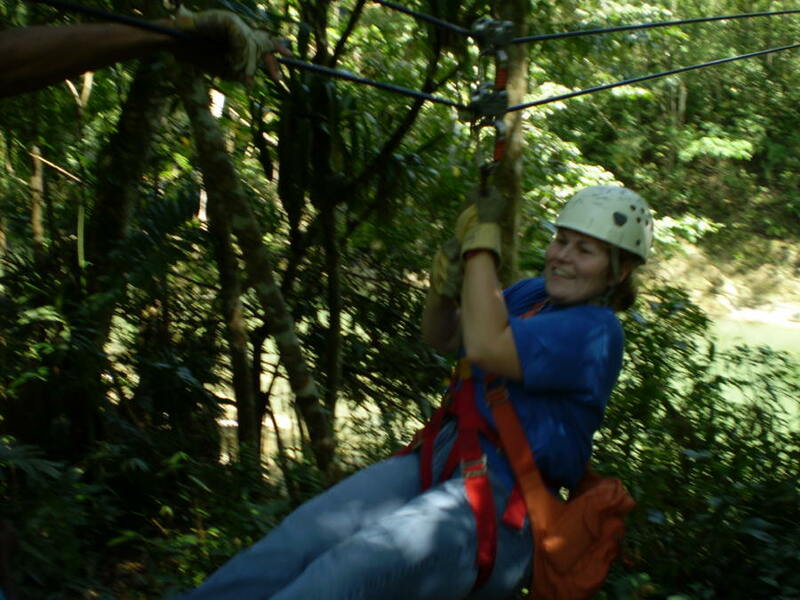 After the guides attached our harnesses to the zip lines, we cast off at high speed over valleys and between the trees. 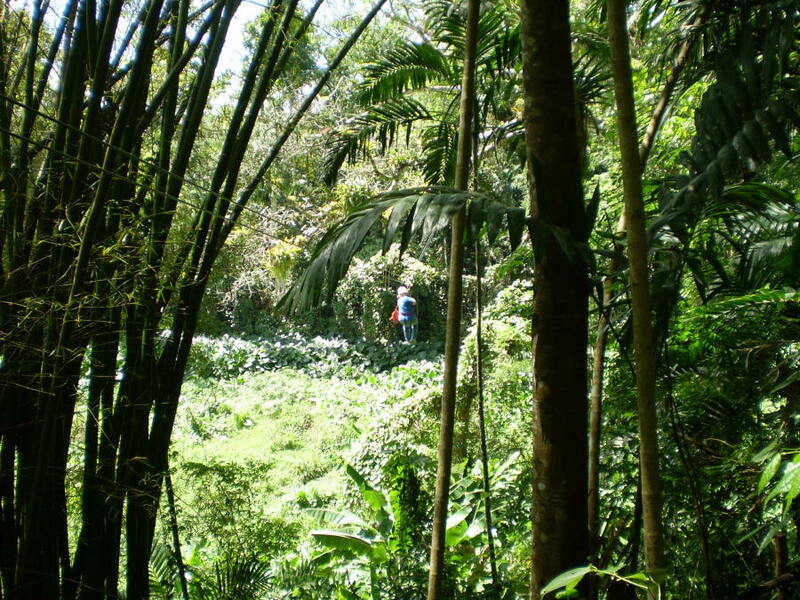 That tiny blue shape cruising across the jungle is Kellie on one of the six zip lines we crossed on our shore excursion. 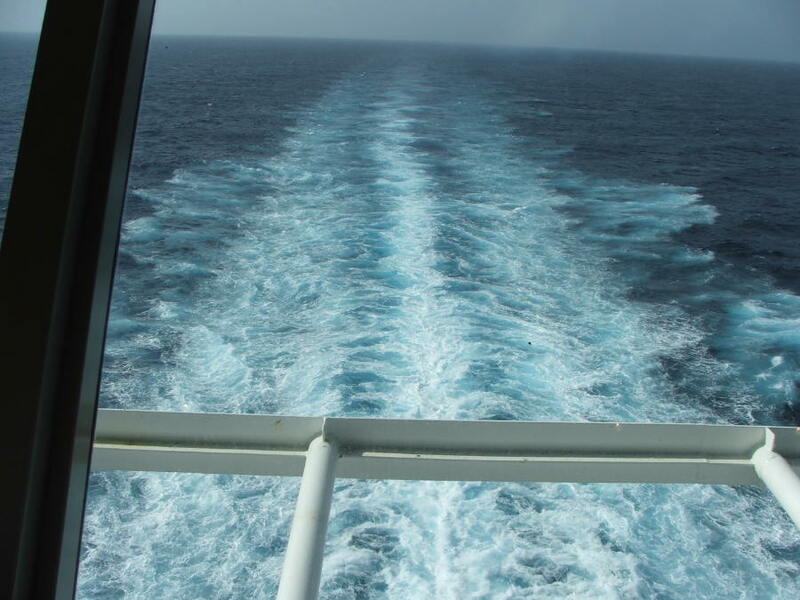 The final line was over 1,000 feet across - longer than the ship we came over on! 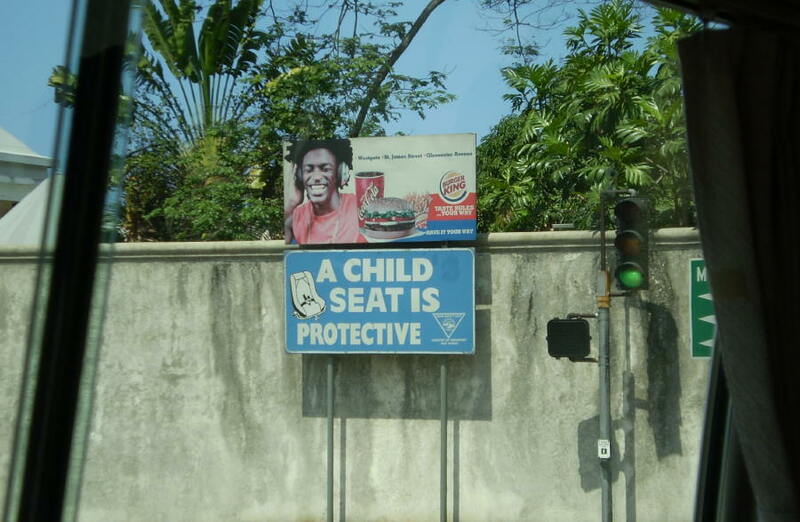 They have a different opinion of child safety seats in Jamaica. 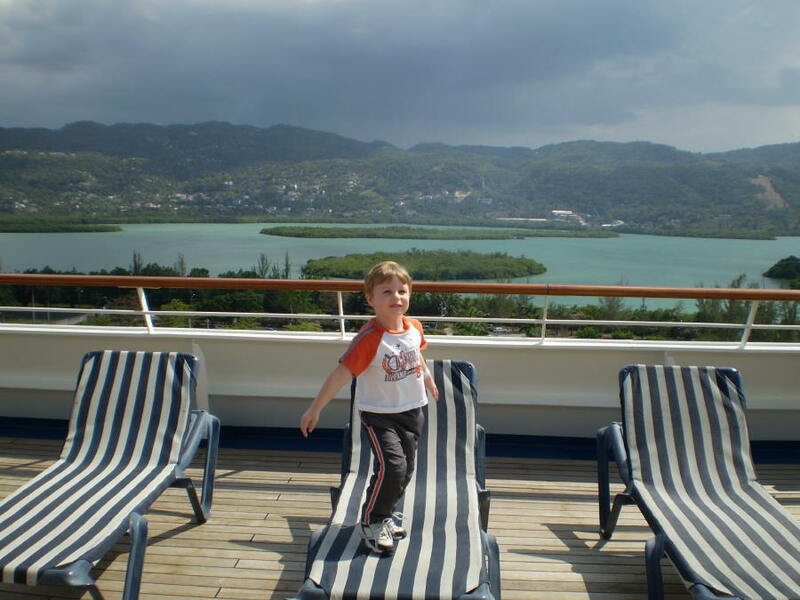 After I got Alex from Camp Carnival, we took some pictures up on deck. Since Camp Carnival is on the 12th deck, we got a good view of Montego Bay (and some approaching "liquid sunshine" in the background). 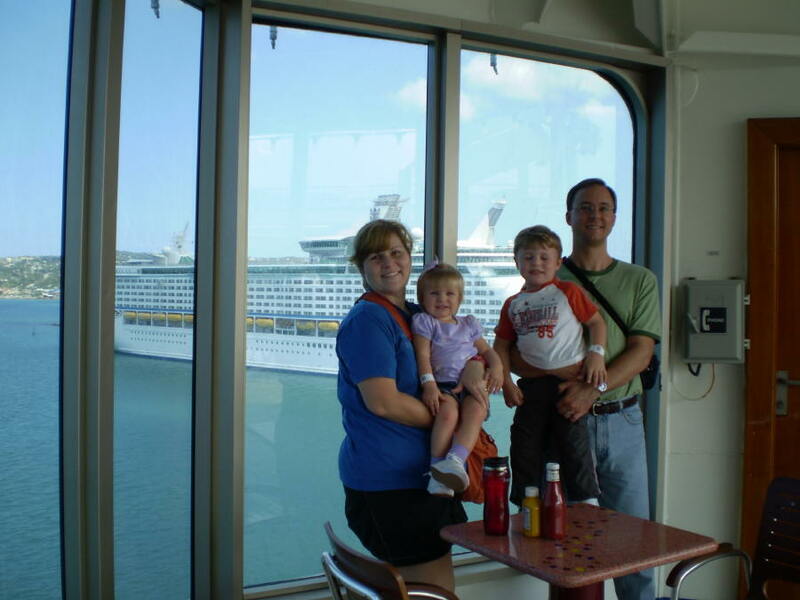 Here we are near the partially-enclosed Sun Pool on the 9th deck. That Norwegian Cruise Lines ship followed us to every port. When we debarked in Georgetown, we spent some time sitting in front of a nearby shop. 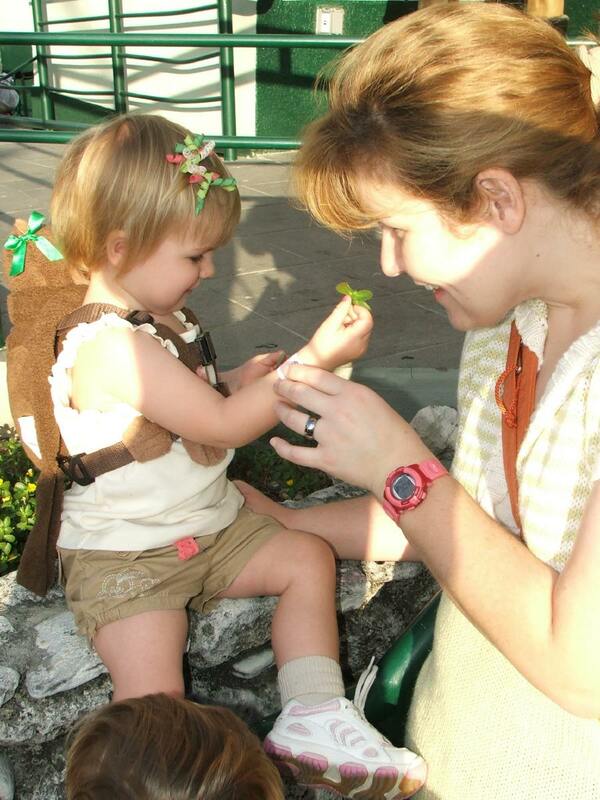 Teagan encouraged Mommie to smell the flowers with her. 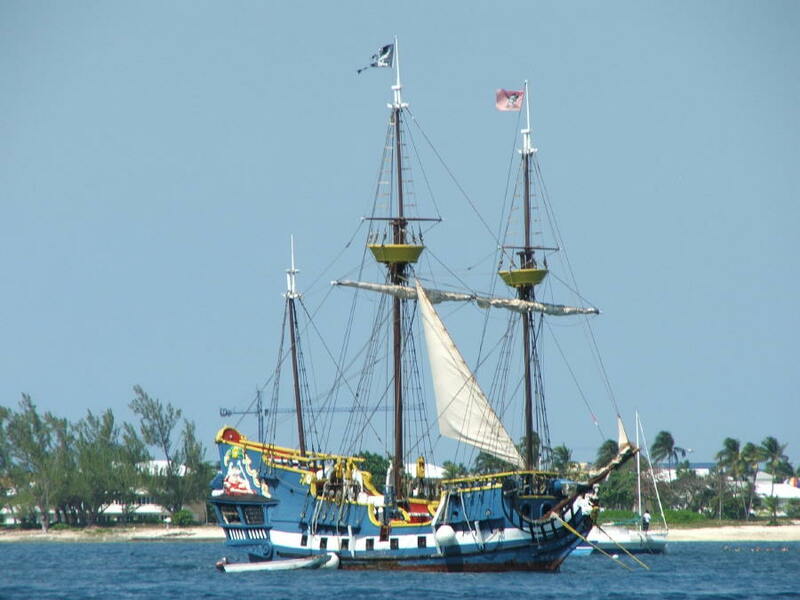 Grand Cayman is a "tender port", where the ships dock off-shore and the guests are brought to town by small boats called tenders. We got our first good look at the Conquest as we made our way to the tour buses. 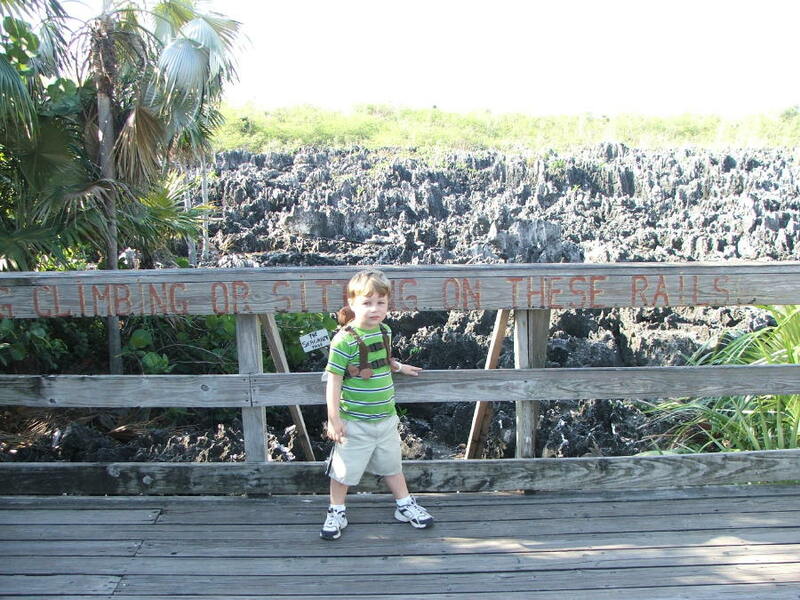 Hell is a small region of the island known for its unusual rock formations. There is a local post office there, so you can send friends and family back home a Postcard From Hell. 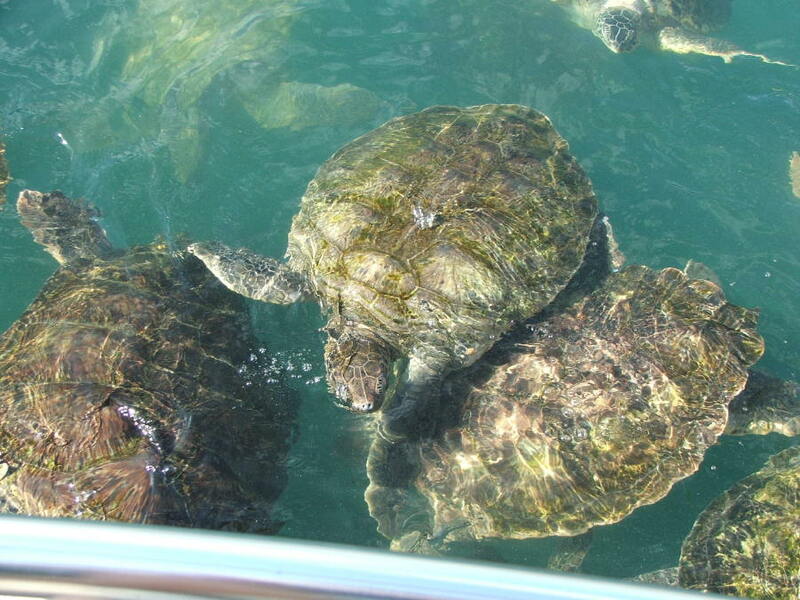 The Cayman Island Turtle Farm raises a large number of rare sea turtles like the ones you see here. The facility has upgraded a great deal since we last visited in 2003. It's a sanctuary of sorts, but they'll come out and tell you up front that some of the turtles are in fact raised for food. They have small, Teagan-sized turtles in a couple of tanks that you can handle if they are in the mood for it. 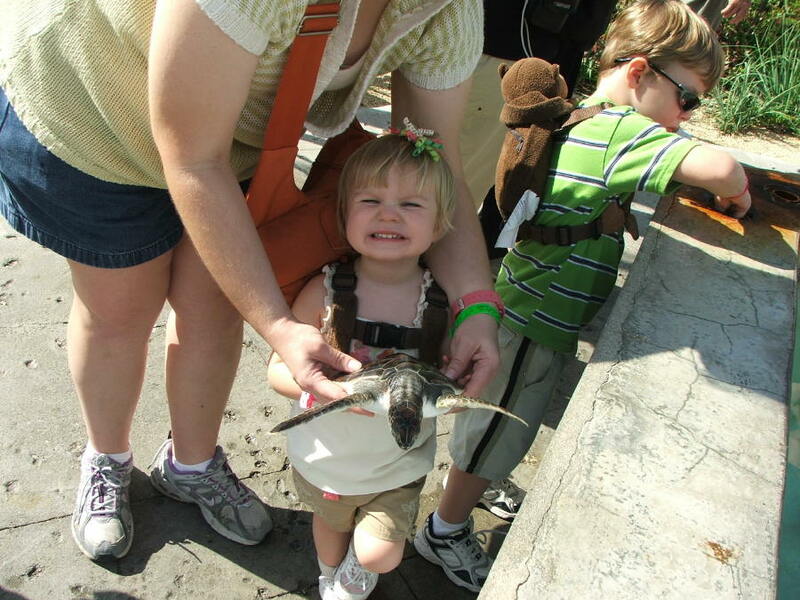 Daddy got to hold a Teagan turtle while Mommie took the picture. 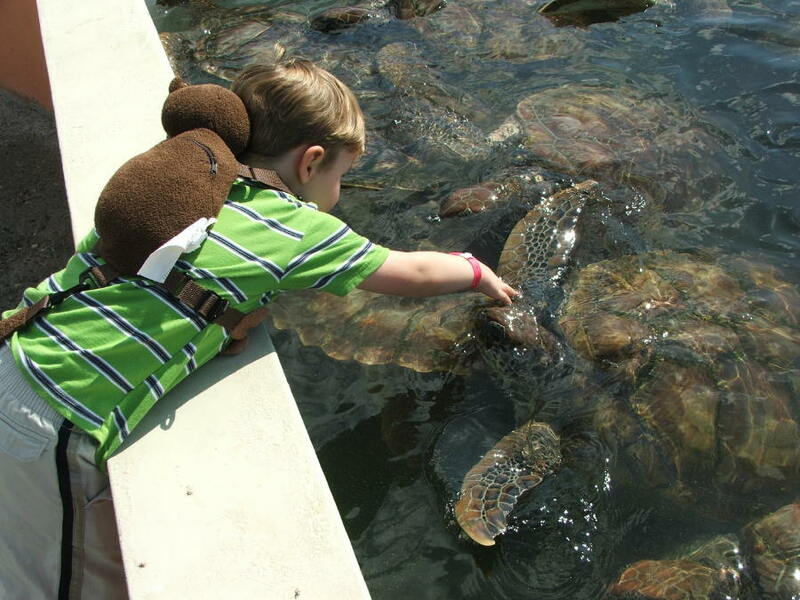 Alex enjoyed petting the larger turtles. He has been wanting to visit them ever since he saw the pictures of us petting the turtles on our honeymoon. We saw a pirate ship! Sid Meier would be proud! 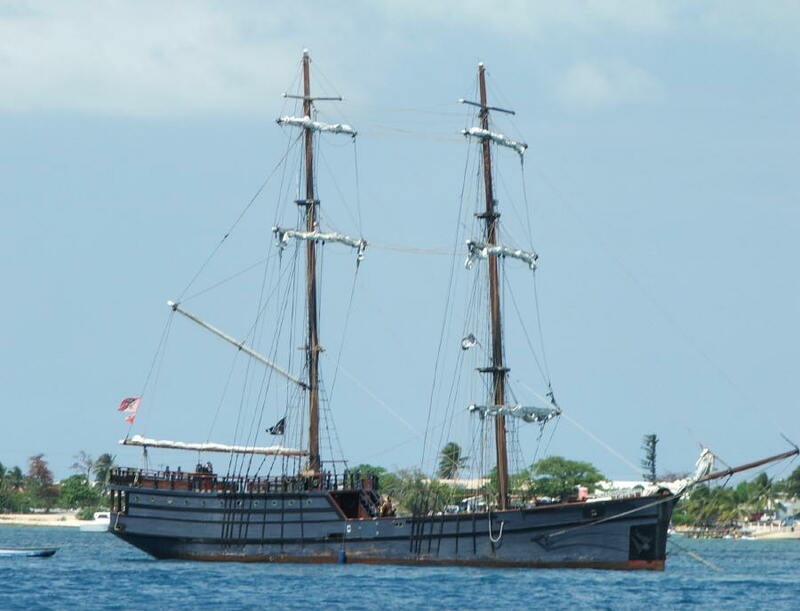 The tour bus driver mentioned that one of these ships had, in fact, appeared in a Disney pirate movie. Of course, the Pirates of the Carribbean trilogy being fresh on everyone's mind, this was pretty exciting; but that wasn't it. This Towel Pal is supposed to be a bunny. Teagan is cuter. 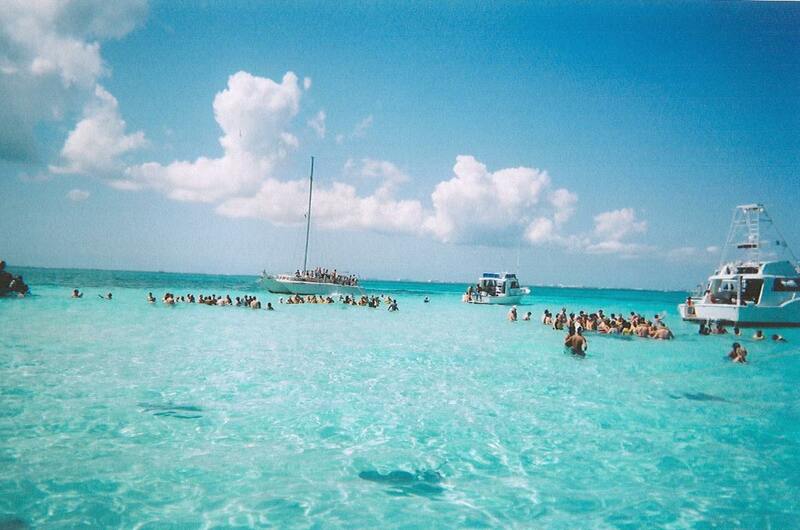 Stingray City is a shallow sandbar surrounded by a reef off the coast of Grand Cayman. The beautiful water is only waist-deep; as you can see, it attracts a great number of tourists. 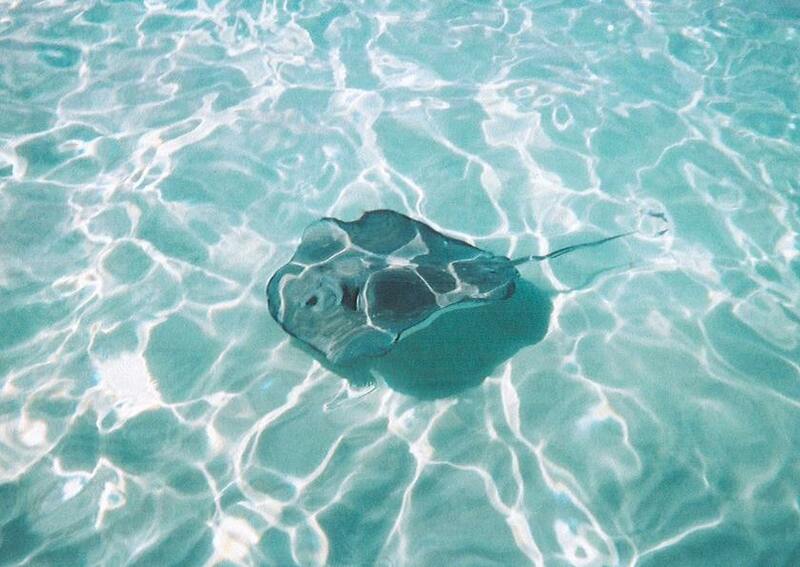 As you approach the sandbar, you can see dark shadows under the water - many stingrays gliding softly and silently along, closing in for a free snack. Teagan got brave enough to come into the ocean when Mommie was there to take care of her. Eventually, Teagan relaxed enough to float peacefully in the clear water. 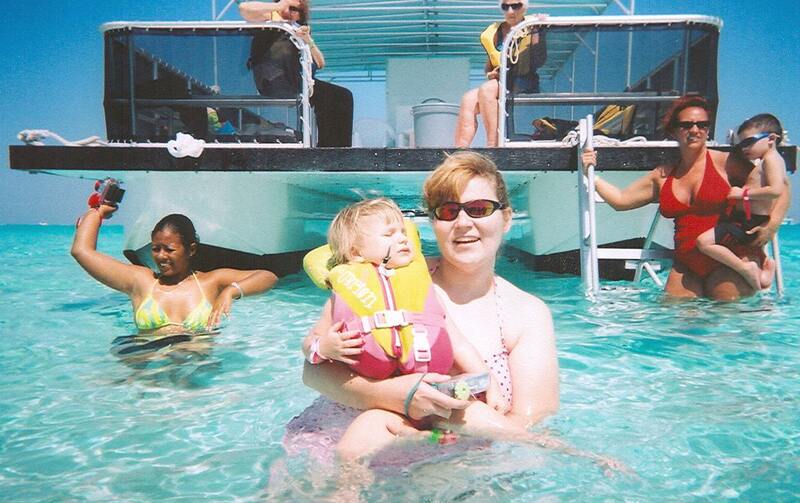 After begging to go swimming while on the boat, Teagan got her chance to try some Mommie-assisted fun in the water. Daddy got to hold on to both kids so we could line up for some photo opportunities. Lucky for us, there was no shortage of cameras. 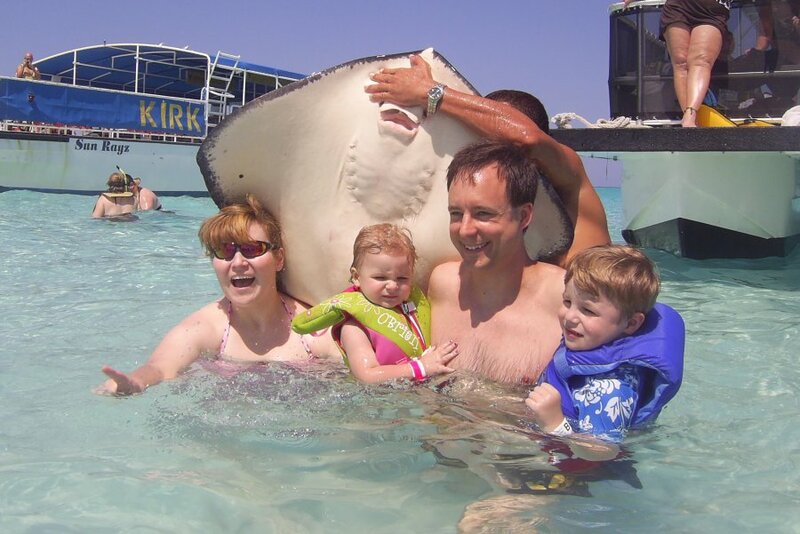 Once fed, the stingrays are docile and pleasant, allowing our family some unusual pictures. 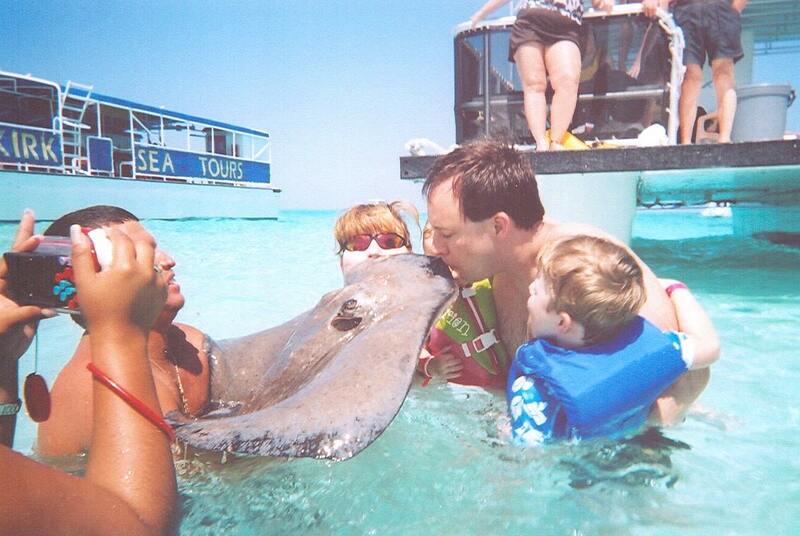 First, the grown-ups get to kiss the stingray. 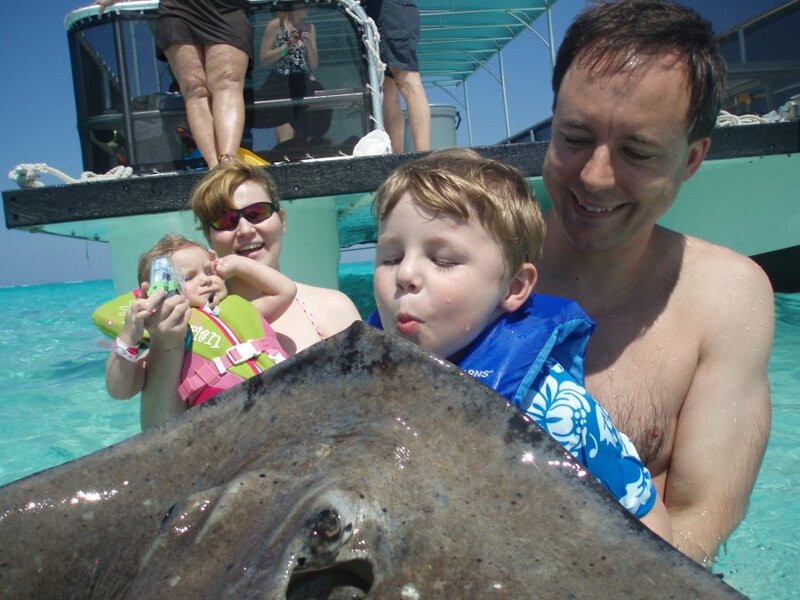 Next, Alex was brave enough to give the stingray a kiss. 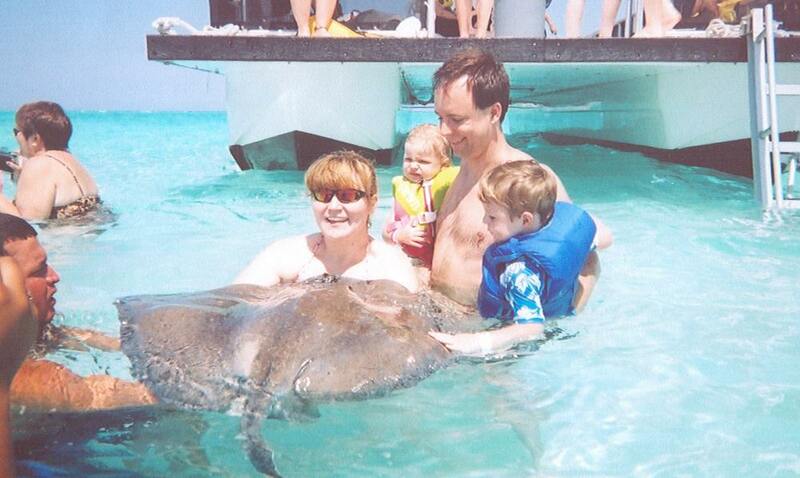 The guide hoisted the stingray up for a family portrait. Shortly after leaving the water, the stingray will blow a blast of water from its mouth, inevitably showering the camera's subjects.